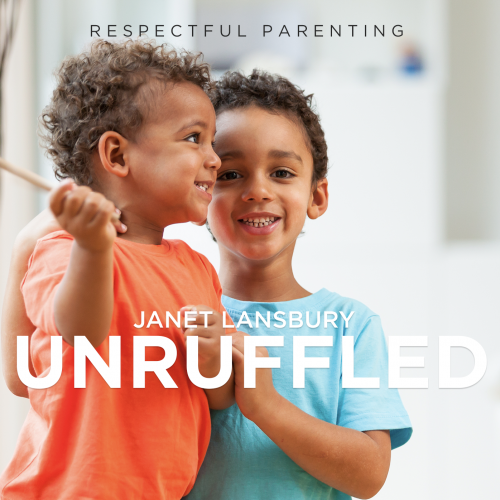 In this episode: Janet offers solutions for handling the disconnect parents sometimes feel with friends, relatives or caregivers who aren’t familiar with their respectful parenting philosophy. How can we communicate our respectful care practices and advocate for our children while avoiding awkward social exchanges, misunderstandings or hurt feelings? Hi, this is Janet Lansbury. Welcome to Unruffled. Today I’m going to be doing something a little bit different instead of responding to one particular question like I usually do. I’m going to be touching on a topic that I hear about a lot, a lot of you ask about, and I remember being concerned about when I was first learning about respectful parenting: how and when to communicate this approach to others. Navigating mainstream parenting norms, specifically with friends, with our relatives, with random well meaning people and with the people that we might be hiring to care for our children. How can we advocate for our child while also not stepping on toes or offending others? I don’t have all the answers on this, but I’m going to explore what I do know, what I have learned through experience and feedback from all the parents I’ve worked with over the years. Okay, so we’ve been working very hard at understanding how to be respectful, gentle parents to our children, and we notice right away that what we’re doing isn’t commonplace, and it can be tricky at first for a lot of us. For one reason, we are maybe really excited about what we’re doing. We see how it’s working. We feel good about it and we want everybody else to be doing this. We want to share it because it’s helped us. I know I felt that way. And then also we might be worried that there are going to be negative effects for our child when other people are responding to them or treating them in ways that we are avoiding. The way they’re handled physically, the way that they’re talked to, or the way their emotions might be getting lovingly shut down. Those things can bother us when we’re working so hard to nurture emotional health and natural motor development and give our child a strong sense of security and self worth. It can be most comforting to know that we as primary caregivers, parents of our children have by far the most influence. And if we think about it, the work we’re doing is actually meant as preparation for them to engage in relationships with all kinds of people that have different ways. It’s not to keep them in this perfect bubble. So as crucial as every moment can feel sometimes with the young children, for us as parents, and the way that we’re caring for them, it’s actually not. They are quite adaptable and resilient. So a lot of the parents that reach out to me with questions around what to do with people behaving certain ways towards their children. I first try to help them see that this isn’t the crisis that it might feel like. It’s not such an urgent issue. My mentor, Magda Gerber, used to even say, “Let the grandparents do what they want. It’s okay.” Obviously she meant within reason. If something was abusive that would be different. But generally we can trust that these other influences are not going to have a negative effect. What I try to do is help parents exhale and know that just as we are not going to be perfect as parents, we can’t expect other people to have perfect interactions with our children, whatever that even means. It’s okay. It really is. And the way that we respond and the way that we do handle these situations, that will depend on what that behavior is, how important it is. For example, if it’s someone being very physical with my child, that would be a situation where I would intervene more. It will depend on my relationship with that person. How comfortable that person would be with feedback and mostly people aren’t very comfortable with feedback around these topics. It’s interesting. It’s a sensitive, sensitive topic for so many of us. I remember when I was first taking RIE parent-infant classes, my child was three and a half months and as much as I loved what I was learning, it would hurt my feelings that the teacher would be offering advice that was counter to what I’d been doing. I felt so vulnerable and sensitive around the way I was caring for my baby. And this can be especially true with the grandparents because they have raised children already and anything that we might offer that’s different can feel like a judgment on what they did. There are also grandparents that blow me away with their openness, and they will say things like, “Oh, I did it very differently but this is interesting, and I love what I’m learning, and I’m open to this.” I hope to be like that as a grandparent someday. Open to new ideas, not threatened by them. So how can we be a positive influence out there? The best way by far is (1)modeling. That’s the way we teach this approach in our parent infant classes that we do at RIE, at Resources for Infant Educarers. The parents sit in back jack seats on the floor, and we observe the children, and the facilitators will mostly be the ones that intervene between two children. When a child is struggling with an object or on equipment, the way we spot, the way we intervene, it’s all modeling. If we model this approach when we’re out at playgrounds and with friends and with family, people will notice. 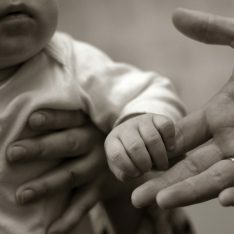 Several times people would come up to me and notice the way I spoke to my children, the relationship that we had even when they were tiny toddlers, the way I included them, treated them as a person, wanted to hear their feelings and their point of view, understood their behavior as a reflection of their comfort level. People notice those things. They don’t know necessarily what they’re seeing there, but they see something different and people will be drawn to it and they’ll ask you, why are you doing it this way? That’s obviously the easiest, most wonderful opportunity to share about it. There are people who have very, very healthy instincts and this does come naturally to them, but it’s not that common. So modeling and openly admitting that what we’re doing is different and that we don’t expect other people to do this. Those are both nonthreatening door openers to communicate this approach. The other general bit of advice, and this is a way of modeling and also advocating for our child, is to (3)interpret in those moments, basically to sportscast, what’s going on. For example, someone comes up to my child, maybe this is a relative, “Oh, I want to hug…” And reaching for my child, and I happened to be there, so I don’t have to run across the room (which is going to be hard for that person to receive without judgment). I might come slowly over or if I’m already there I would just put my hand in between them for a second and say to my child, “Sounds like Aunt Susan would love to give you a hug. Are you okay with that? I’m just helping that person to pause so that I can include this younger person in the interaction. In that moment I’m modeling for that older person respecting a child. I’m demonstrating that I see a person there with a point of view that’s valid that I want to include. I’m not being rude, I’m not putting anyone on the spot. This isn’t being overly protective, hovering. It’s just seeing something that might override my child’s boundaries and giving them the opportunity to express themselves. I wouldn’t feel embarrassed that my child is uncomfortable with this. I think it’s normal for a child to be uncomfortable with someone excitedly coming over to touch them. I actually want my child to be discerning in that way. So yes, it can be a little uncomfortable if that adult doesn’t see what I’m modeling and doesn’t take this in, and they don’t care what the child feels or maybe they don’t see them as able to have an opinion yet, and they keep going with what they want to do. That part could feel a little confrontational when our hand is there, and we’re not going to let that happen, but that’s where I would have a boundary and allow people to have whatever feelings they have around that. Just as we need to set boundaries with children and not be afraid of their feelings. We have to do this with adults as well, and it’s not easy for people like me that are more on the people pleasing side generally, but this is the inspiration our children can give us to have boundaries, to stand tall, be unafraid, that we’re going to disappoint people when we’re doing reasonable things. 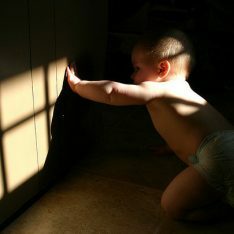 Children help us shift those priorities if they need shifting. It’s one of the gifts they give us. For me, one of the things was I was entertaining my daughter nonstop as an infant, constant noise and music and in her face, and I didn’t realize until I took her to a RIE class and my teacher said, “Lie her down here and observe,” that my daughter had her own thoughts. She had all these things going on internally. She didn’t need me to be basically stuffing her with stimulation. She needed time to look around and be, and look at the things she wanted to look at, have her own thoughts. That was one of my initial aha moments for me with this approach. Another big part of my journey was understanding that setting boundaries and allowing my child to be upset about them if she needed to be, was more loving than just letting them go and saying, okay, I don’t care. I had to reframe love. I’m not someone that likes setting boundaries. I’m not someone that likes anything but pleasing people and not having to do that hard stuff. But I had to find that part of myself. So that’s a journey that I share a lot with parents in detail, depending on what’s going on with their child that I want to help them with. 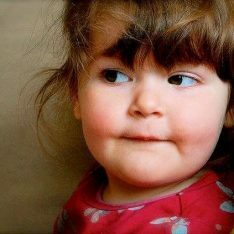 Another common situation I’m asked about is when someone wants your child to say something, they’ve said hello, and it could be a stranger in the supermarket, or it could be a relative, but someone wants your child to say hello. And the parent often understandably feels uncomfortable in this situation. But when we understand young children and how aware and sensitive they are to all of our feelings, especially as their parents, we realize that our tension in that situation is making what might be possible, impossible. Because it fills the air. It can make it hard for a child to breathe and find the space to open themselves to saying hello back to someone. All they feel is this intense cloud of tension coming from us, our disapproval, maybe our own shame, our impatience. In those situations, ideally I would respond to that person myself after a moment, not just jumping in uncomfortably. Let’s say the person says, “Hi sweetie. Oh, I love your dress.” And your child doesn’t say anything. I would breathe. Wait a moment and then turn to the person and say, “Well, thank you very much. It is a nice dress. Isn’t it?” Leaving that space open for my child, that emotional space. That will help them get to that place of responding on their own. But once we start judging and feeling nervous ourselves, it’s so much harder for our child to do what we want them to do. We’ve got to let it go to win it. Tough challenges for us. Now, let’s say it’s a person that is telling our child: “Don’t cry, don’t be upset.” Or, “You’re okay. You’re okay, you’re fine, you’re fine!” I would let that go and know that my child is going to feel my openness to their feelings and my comfort with them having their feelings. If I get in there and interject my own words into that experience, it’s just going to make it more cluttered for my child. So I let that happen. I’m there, but I’m not saying anything. Afterwards, maybe there’s a time to say, “You heard Grandma getting impatient around your feelings. People get really uncomfortable when people they love are upset, and it’s hard for them.” And then again, depending on my relationship with these people and the situation, it might work for me to actually say to the grandmother, let’s say, “It’s so hard when they’re upset, isn’t it? What we’re doing is we’re (5)acknowledging that person’s feelings. Sometimes there’s a place for that: teaching our child something and also validating the person and maybe helping them to see why they’re reacting the way they are. So instead of feeling overwhelmed and unhappy about these experiences, I would see them all as opportunities for us to stretch in our empathy, humility, and being that peaceful model ourselves. Also, please check out some of the other podcasts on my website, janetlansbury.com. They’re all indexed by subject and category, so you should be able to find whatever topic you might be interested in, and both my books are available on audio, No Bad Kids, Toddler Discipline Without Shame and Elevating Child Care, A Guide To Respectful Parenting. You can get them for free from Audible by following the link in the liner notes of this podcast, or you can go to the books section of my website. You can also get them in paperback at Amazon and in ebook at Amazon, Barnes & Noble, and apple.com. Thank you so much for sharing this. You mentioned all the points I’m struggling with. I very much appreciate your calm answers to these typcial situations. I really love the way RIE parenting helps me learning to stop being such a people pleaser. It is hard, but it is worth it. Thanks again for your wonderful work. It made life with our son so much easier and happier. Greetings from Germany! Hi Anja! It is my pleasure and I’m thrilled to be able to share this approach, which has changed my life in the most wonderful ways. Greetings back to you in Germany! Thank you for your support. This episode is very timely for me! I’m staying at my mother’s house this week with my almost 1 year old and am struggling a bit with this. My mom is well meaning, but parented me very differently than how I choose to parent my son. Mom and I have gone through a lot in the past few years and it’s been difficult for both of us. Your podcast has made me realize that I need to let go of some of her interactions with my son that, in the grand scheme of things, are really no big deal. I am sorry to hear you are struggling but, yes, I do think the answer is often to let go and keep these situations in perspective. Take care! This is a timely podcast for me as well! My mother is staying with me to help with my 2 year old while my husband is away for work, which is fantastic help in general, but we definitely differ in our approach to my daughter. I am trying to let most things go, however i am also expecting a baby in a month or so and my mom wants to stay and help then for a potentially prolonged time, so i am hoping to get her more on board with understanding the general RIE approach, as well as the specific approach to setting limits and how important consistency of those limits are for my daughter as we approach this big change of adding a sibling to our family. Your advice is always so so helpful. Thank you again! Janet, this is so helpful! I find myself taking these tips and trying to apply them to similar situations with my spouse and co-parent, who isn’t as on board with these techniques. I wonder if others have the same struggle and if you might be able to address this more specifically in future. Thank you for all you do! Thanks Janet you are such a calm inspiration. What about the “What’s your name?” stranger question…? We get that a lot and the silence is usually filled by the stranger saying “oh, he is shy” which I would rather avoid. There’s also the distinction between strangers to the child but known to me and strangers to us both. I feel like right or wrong, my expectations are different there – I expect my 4 year old to look at adults I introduce him to and say “hello” at least. Thoughts?